BP Can Go Eff Itself! 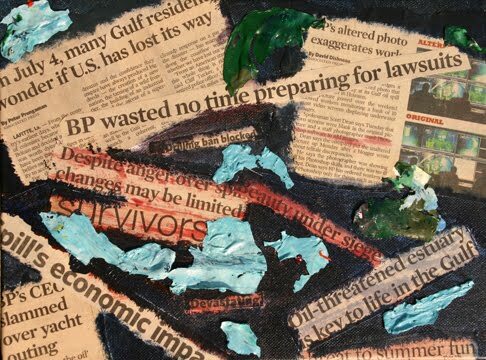 The news headlines about the Gulf Oil Disaster have been weighing me down for weeks and I didn’t realize how much it had dominated the news until I sorted through the stack of newspapers I use for protecting surfaces in my art. There were so many heart-wrenching headlines and I got more and more pissed off, so I tore them all out and figured I’d process them somehow. At the same time, I had some remnant acrylic paint that kind of looked like the earth from up in space – green forest, blue water, and such. I had been mulling it over with the intention of using it in some abstract or another. One thing led to another and … Voila! I think I feel better! This entry was posted in BP, collage. Bookmark the permalink. >Love this. It captured it all brilliantly. Well done.